When we go shopping for groceries, the first thing we usually do is check the expiration dates on the products we buy. 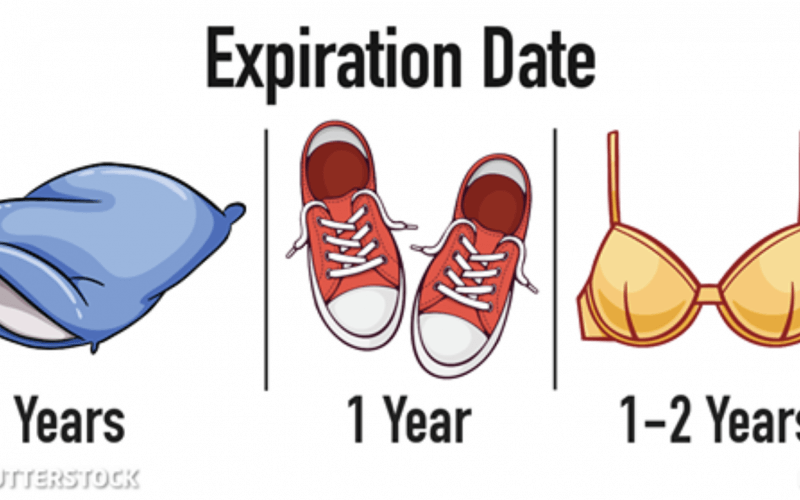 However, there are certain items in our homes that to not have their expiration date written. This does not mean that they will last forever. Sometimes, even when they are in neat condition these common items can be harmful. Here are some of them. It is very important for the pillows to be changed regularly. Not only they lose the comfortness, but also, they become an unbelievable home for dust mites. The slippers need to be changed from time to time because they can spread fungal infections. Some types of slippers can be washed without them falling apart. Sponge: 2 weeks & Shower Pouf: 6 months. Shower utensils can breed fungus and mold. Don’t use expired sponges and poufs to clean your body! For natural and synthetic shower poufs, boil them in hot water to kill growing bacteria. The towels lose their absorption power and if not washed regularly they are an optimal environment for bacteria growth. Make sure you change them at least every 3 years. We all know we are supposed to replace our toothbrushes when the bristles begin to wear down. Furthermore, change your toothbrush after a flu or a virus. That way you will avoid getting sick again. It is important to clean your brushes thoroughly at least once a week and replace them with new ones every year. Perfumes with essential oils can last for three years when they are store closed and two years when they are store opened. Eau de toilette is fine for four years when stored closed and two years when stored opened. Latex pacifier must be replaced, regardless of their condition and how long they are used. Latex easily breaks, and the cracks breed germs. The plastic and foam deteriorate over time, losing the shape of the seat until it can no longer protect the child. It’s more ideal to buy a new car seat for your child instead of a second hand version. After 250-300 miles, the cushioning of the sneaks begins to break down. However, your joints are experiencing unnecessary stress. Spices lose their smell and taste over extended periods of time. Ground spices, in particular, should not be kept more than six months. So, if you find a large bottle of nutmeg that you never use, it’s a good time to pitch it. The best flour can only be stored for about a year. Even though the expiration date is 15 years, make sure is yearly maintained. The disinfectants start losing their effectiveness after three months of use. After two years, any repellent becomes useless.